Texas Hold’em is similar to standard 5-card poker. However, instead of receiving 5 cards, each player only receives 2 cards. These can be combined with up to 3 community cards to build a standard 5-card poker hand. For example, if you are dealt a Seven and a King, and the community cards are a Four, a Five, a Jack, and a pair of Kings, then you could combine your King with the two Kings in the community cards for a Three of a Kind — just like in regular poker! Action at a table begins with one player being designated as the Dealer, identified by a white “D” chip. A new dealer is designated each round. Each player then receives two cards that only they can see, called the Hole Cards. 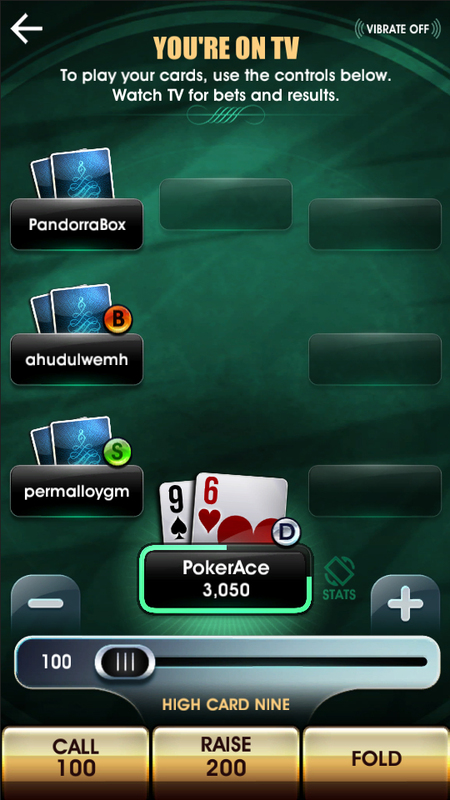 Players can view their hole cards on their mobile device and switch between face-up and face-down views by touching the cards. After hole cards have been dealt, the first round of betting occurs in a clockwise order. The first two players have their bets placed automatically, called the Small Blind and Big Blind. The Big Blind determines the minimum bet for the rest of the game. In Tap TV Poker, the Big Blind is always the same. After the first round of betting, three face-up cards are dealt to the table, known as the Flop. These cards are considered community cards, meaning everyone at the table can use them in combination with their hole cards to form a winning 5-card poker hand. A second round of betting then occurs. After the second round of betting, a fourth card is added to the community cards in the middle of the table. This is known as the Turn. After the turn, a third round of betting occurs. After the third round of betting, a fifth and final community card is added. This is known as the River. After the river, a fourth and final round of betting occurs. Once all players have finished betting, the Showdown occurs. Each player’s cards are revealed and the player with the strongest 5-card poker hand is declared the winner. Once the winner has been declared, the next hand of cards begins. In each round of betting, players have 12 seconds to call, raise, check, or fold. If a player chooses to Call, they place the minimum bet as determined by either the Big Blind or the most recent raise. If they choose to Raise, they increase the minimum bet for the table. If no players have raised, a player can choose to Check rather than add money to the pot. In the first round, only the first player after the Big Blind can check. If a player chooses to Fold, their cards are returned to the dealer and they do not participate for the rest of the hand. Each time the minimum bet is raised, players get another opportunity to call, raise, or fold. Betting continues until all active players choose to call. If two players have the same exact hand, the winner is determined by the high card in their hand and any unused cards, known as Kickers. If two players both have the same high card and kickers, or if the five community cards create the highest possible poker hand, the game is declared a Tie and the pot is split between all active players. A Side Pot is a special case where one player goes all-in and at least two other active players with more chips continue to increase the size of the pot. For example: Player A has 100 chips. Player B and C have 1,000 chips. If Player A goes all-in with 100 chips and B and C call, the winner will receive 300 chips. However, if Player B raises to 200 instead and C calls, there is now one main pot of 300 chips and a side pot 200. Player A is only eligible to compete for the main pot of 300 chips. Of the 3 players, the player with the best hand will win the main pot. Player A cannot compete for the side pot, only players B and C can. Of those two players, the player with the best hand will win the side pot.